Designed to complement the Radius 360Â°, the FlexEdge system handles a variety of sanding challenges with everything you need to take on corners, tight angles, outlets, bumps, and more. Swap out the abrasives on your FlexEdge for the right tool for any jobÂ the FlexEdge leaves a perfect finish every time. Pressure pad-The patented design is our secret weapon. Added core pressure eliminates bumps and prevents binding and stuttering to ensure a faster, higher quality finish. 1/4 Foam Pad For use with our economical Flex Paper, this pad helps the paper hug the wall for a flawless finish. Flex Paper A durable, economical abrasive for fine finishes at an excellent price. Flex FoamÂ Designed for conditions when paper just won(TM)t do, this durable foam pad handles bumpy surfaces like outlets, nails and pocks without tearing or causing unwanted surface scuffing. 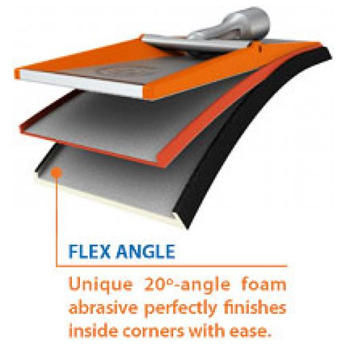 Flex Angle A resilient abrasive with unique 20Â° angle, for precise corner finishing time after time. The FlexEdge is designed to conform beautifully to any surface, while its low center of gravity lets you maneuver with ease. The hook-and-loop attachment system allows for ultra-easy abrasive changing, and prevents slack to increase durability and give you a better return on your abrasive investment. The hook-and-loop attachment system also prevents dust and foreign objects from lodging behind the abrasive, for an impeccable, scratch-free finish. Provides complete wall contact at all times for great overall sanding. Durable aluminum oxide abrasive paper comes at an economical price. Unique low-profile, hook-and-loop attachment eliminates paper slack and movement so abrasive lasts longer. Combine the finish quality of a hand-held sanding sponge with the productivity of pole sanding. Use our flex foam abrasive pad for more rugged sanding environments when paper might cause tearing and scuffing (outlets, bumps, nails). The unique, durable 20Â° angled abrasive provides exceptional precision for corners, or small areas. Handles bumps, outlets, even nails! This rugged, resilient foam abrasive was designed for surfaces that frequently damage sandpaper, causing unwanted scuffing. The durable foam glides over outlets, bumps, even nails, with ease and unlike paper, a flaw in its surface will not scratch or cause a mark. Wash and re-use multiple times. A great value. Long lasting, easy-to-use, with washable aluminum oxide grit for a consistently high-quality finish. Delivers higher quality than sheet sandpaper with no bridging of low areas. Will not scratch when properly used. Cover entire corners without extra sanding with an abrasive that cuts faster and lasts longer for a better return on your abrasive investment. High resiliency allows you to sand over outlets with no snagging or damage to abrasive. Can be used even if damaged, without compromise to finish quality. This resilient foam abrasive lets you finish inside corners with ease. Two 20Âº angles provide two-sided finishing power, leaving a clean line and a perfectly finished corner every time. Delivers a higher quality finish than sheet sand-paper. Cuts faster and lasts longer for a better return on your abrasive. High resiliency allows you to sand over outlets with no snagging or damage to abrasive. Pressure Pad – Added core pressure eliminates bumps and prevents binding to ensure a higher quality finish. 1/4′ Foam Pad – For use with our economical Flex Paper. Helps the paper hug the wall for a flawless finish. Flex Paper – A durable, economical abrasive for fine finishes at an excellent price. Flex Foam – Durable foam pad handles bumpy surfaces like outlets, nails and pocks without tearing, or unwanted surface scuffing. Our patented EPDM rubber Pressure Pad is designed for maximum efficiency and an impeccable surface finish. The unique design adds extra pressure to higher areas and imperfections, eliminating them with ease and absorbing bumps to prevent stuttering or binding. Hook-and-loop attachment for easy replacement and a strong bond. Replace the rubber, not the tool! 20Â° angled edges protect adjacent surfaces and give added structure to cut straight lines in corners. Finish corners perfectly with no damage to any surface. Flex Foam Durable foam pad handles bumpy surfaces like outlets, nails and pocks without tearing, or unwanted surface scuffing. A fine finish, at a fine price. Our Flex Paper was designed to resist curling and last longer for the best possible value and a consistently fine finish! Must be used with the Flex Foam Replacement Pad. Use in open areas or corners. Resists curling in humid weather. 1/4 Foam Pad – For use with our economical Flex Paper. Helps the paper hug the wall for a flawless finish. Flex Foam – Durable foam pad handles bumpy surfaces like outlets, nails and pocks without tearing, or unwanted surface. Flex Angle – A resilient abrasive with unique 20Â° angle, for precise corner finishing time after time. Comes in 100, 150 and 220 grit. A better return on your abrasive investment. Designed for use with our Flex Paper, this foam pad forms perfectly to your work surface, and may be used in open areas or corners. Helps Flex Paper hug the wall for a seamless finish. Low-profile hook-and-loop attachment system prevents collection of debris behind sandpaper sheet. Durable, easy-to-use aluminum oxide abrasive with unique functional enhancements that enhance resiliency. Pressure Pad Added core pressure eliminates bumps and prevents binding to ensure a higher quality finish.